This entry was posted in 2016 Election, Congress, conspiracy, Dept of Justice, Donald Trump, Hillary Clinton, Liberals/Democrats/Left, Republican Party, Russia and the 2016 election, United States, US Presidents and tagged Internet Research Agency (IRA), Mueller Report. Bookmark the permalink. Thank you for gathering this most important information and disseminating it to us. It does not make any difference to the Demon Rats–they really do not care what Barr’s report says . . . they are fully prepared to piddle away $millions more in furthering this witch hunt. My fervent hope is that the voters will take into consideration of the action of the Dems come the next election. They need to be swept from office. Do you think they dragged this out for so long to get us tired of it and give up??? 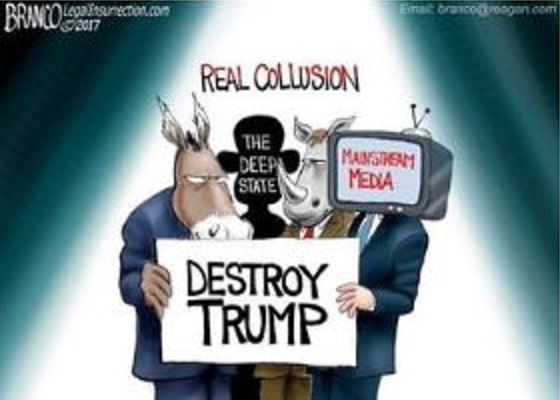 A very important point to keep in mind is this coup attempt with the lying Bolshevik MSM assisting with their constant outrageous falsehoods, has destroyed millions of people’s trust in them.